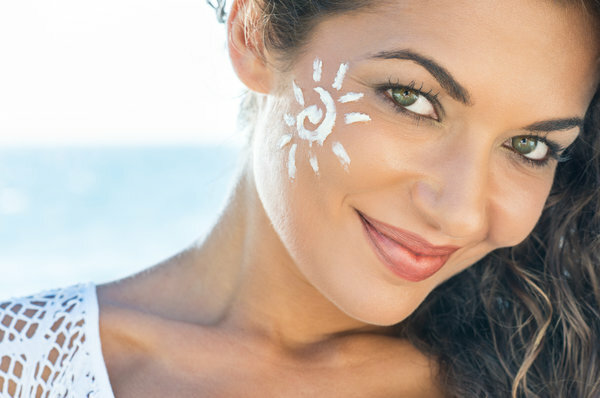 The sun’s rays can tan your skin and give you that beautiful, healthy glow that so many want. The other side to suntanning is that the rays can also damage your skin, creating painful sunburns and even skin cancer. Sunscreen protects against cancer, so you should use it anytime you are going to be exposed to sunlight. The simple act of slathering on some lotion or spray can go a long way towards keeping your health in check. The sun creates two kinds of rays that enter the earth’s atmosphere. One is UVA, or ultraviolet A waves, which are long-wave rays. The second is UVB, or short-wave ultraviolet B ones. UVB is the main culprit behind most sunburns, so you want to look for lotion that has a high UVB sun protection factor, which is also referred to as SPF. These UVA and UVB rays damage the skin by burning it, which creates uncomfortable sunburns. The skin becomes tight and might eventually peel, which can itch. It also ages your face prematurely, and can really dry it out. So in addition to cancer, sunburns create a whole host of other potential issues for your body. That’s why it is so important to apply sunscreen before you go outside. In fact, one of the biggest errors people make is applying it while outside. You should slather it on a full 30 minutes before exposure begins. Then remember to reapply at least every two hours. You may want to reapply more often if you are sweating profusely due to activities or an extra hot day. If you are swimming, you should put more on as needed, since even waterproof formulas come off in water. You should also get a lotion or spray with a high enough SPF for your skin. Something with an SPF of 30 keeps out 97% of the rays, while SPF 50 will keep out 98%. The fact that a small amount still gets through is even more reason why you should keep reapplying at least every two hours.